I have an 86 KLF300A with shattered magnets in the magneto. Looking for options before scrapping the ATV as it is/was a good running quad in excellent condition. I have seen aftermarket magnetos for arctic cat that resolve the weakness with the old design in their models, does anyone know of an interchange magneto that would fit the KLF300A motor? I know there are used magnetos available but they are not in my budget. Thanks all. So sorry about the broken magnets! old Goldwings when the stators go bad. All the magnets were damaged in some way. I've seen on the newer designs there is a metal ring fitted in that holds the magnets in place as well as the epoxy, a more permanent fix. I guess since this particular flywheel/magneto was only used for 2 years the aftermarket never developed for it. I am not surprised that I cannot find replacement magnets, since they would have to be curved, and curved in opposite directions to correspond to north and south, and curved to fit a certain size circle at that. . 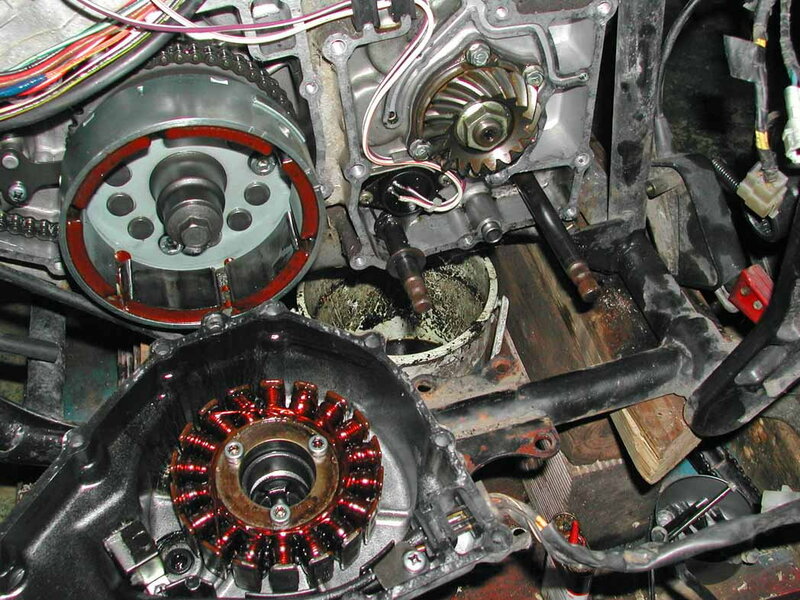 I am going to look into doing an external alternator, that is a good idea, thank you! On yours, do you just hope that the magnets on the replacement never fail like the original? The going rate on a used one right now is about $500 i cannot justify that cost for something that might have the same problem shortly. I do love my bayou, I agree the differential really sets it apart. Yeah, the 86-87 KLF300As where unique. The Bs and Cs are different, as you know. I wonder how much different the B flywheels are. $500 is crazy money for a flywheel, tho some go for half that on eBay. Still too much, IMO. There was an optional pull-starter on the As, but mine does not have it. It makes a convenient PTO to drive external devices, either directly, or with a pulley. I have seen it used to drive a hydraulic pump on a big quad. Looks like it is DC ignition same as the later ones, so only needs a signal from the trigger coil on the outside of the flywheel to spark. If it still gets one with no magnets inside, I would run it without the magnets. It won't charge the battery, but as long as the flywheel is still balanced, all you need are two batteries, one on charge at home, and one on the bike, once the starter slows, you swap batteries. Not suitable for all applications, but unless you need lights, one battery would probably last a day or so. Old KLF 300s don't seem to make much money, so there should be scrap engines about for fairly low prices. You could keep a lookout for one, then swap the whole engine. Yes, and I think my trigger will be ok once I get all the magnet off of it. Just waiting on a flywheel tool to get it off so I can fix the starter clutch that is probably full of magnet also. I like your idea merryman I mostly ride during the day anyway. I'll try firing it up once I get the starter engaging again. Yeah, you can see the pickup coil on the left side of the photo I posted. difference, and they can be had for under $60. so long if the quad is hard to start. steel one rusts out. I sold my rusty one on eBay for $80 (!) and fabbed up a stainless steel one. I am planning to get my hands on a 300B flywheel and i'll at least try. I agree, the 300A has the biggest battery of all our atvs and it takes almost nothing to run ignition. Starter chain is stretched out too, could be what knocked all the magnets loose. Did you change out your starter chain as well sr? Let us know if the flywheel is close enough to mount and work. broke inside the casting and I failed in drilling it out. I shoulda used heat. damage the epoxy? Just guessing here.